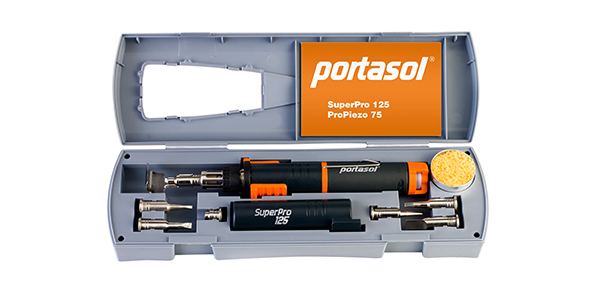 Portasol introduced the SuperPro 125 Professional Soldering Iron (SP-1) for the automotive professional. This unique soldering iron is portable and easy to use. There are no cords or wires – it’s completely powered by butane. Just one tank-full of butane will run this soldering iron for up to 60 minutes, and provide 25-125 watts of adjustable power. It’s ready to melt solder in less than 30 seconds from the time you turn it on. The ultrasonically welded gas tank provides a safer, more reliable butane torch than you’ll find elsewhere. The SP-1 can be purchased individually or in a kit with seven additional tips (No. SP-1K). The kit includes four different soldering iron tips, as well as a tip that forces hot air for heat shrink applications, a torch tip and a hot knife tip. “The SP-1K SuperPro Kit is an excellent tool for the technician who needs powerful heat and versatility. 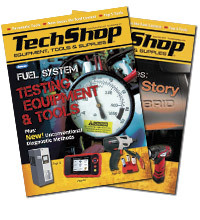 The seven tips in the kit make the SP-1K a must-have tool for any automotive or auto body technician,” said Sandy Allen, Portasol national sales manager. It is certified ESD-safe and is anti-static. Every Portasol product is made with butane compatible plastics to prevent leakage. When the manufacturing process is complete, each Portasol tool is tested for a full two weeks before they are packaged and sold to the U.S. market. The SuperPro 125 comes with a 12-month replacement warranty.